Winter patties are basically sugar. They are for emergency feeding. They may help a colony survive late winter starvation that can be a problem for beekeepers in the upper Midwest. 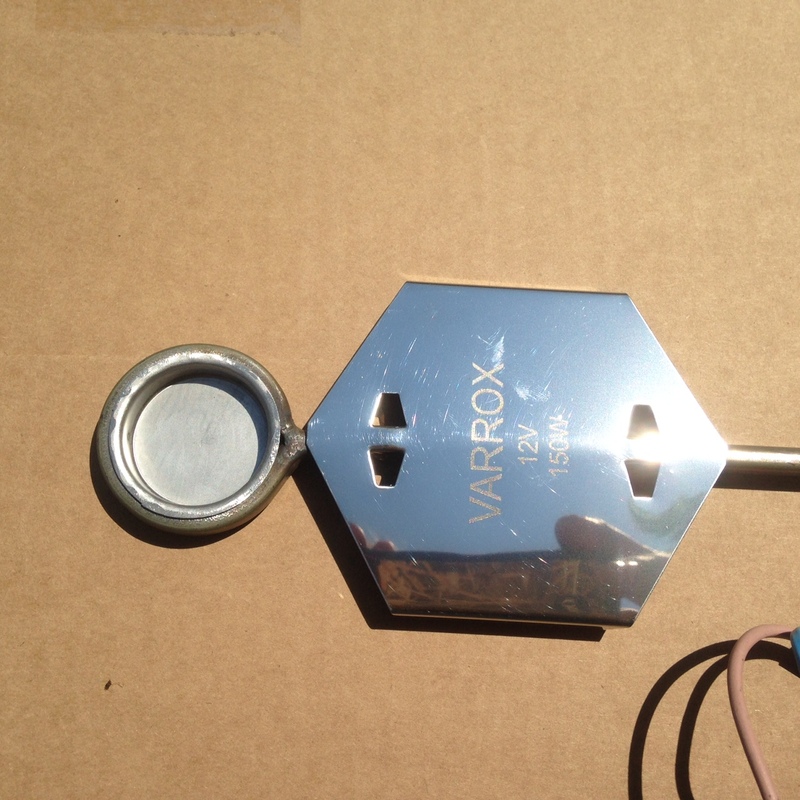 A customer sent me some pics of his use of a Oxalic Acid vaporizer. He did not treat for Varroa at all in late summer. The Oxalic Acid Vaporizer did work well on taking out his mites. The Univ of MN would like all beekeepers to take part in their mite survey. This is a great way to find out mite count around the state of MN and WI. This mite count can help us to determine the mite load of a general area of the U.S. This forum is hosted by local political figures. The local area politicians are concerned about pollinators and need information to see how they can help. 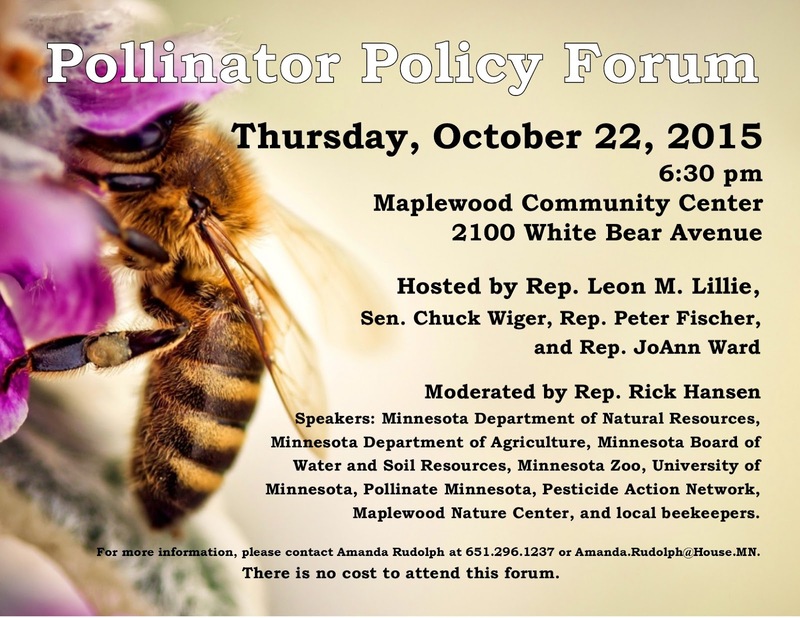 This can greatly help beekeepers establish better forage for all pollinators with the state of MN and the other contributors in attendance. Better forage will lead to stronger more prolific colonies that will a chance to have better survival. Here is a link to the Govt. Oxalic Acid Label Instructions. The label describes the hazards of using Oxalic Acid, proper dose mixing levels, methods of application. Both drizzle and vaporization methods. The link takes you to the PDF page. Open the PDF, it is a two page document. This is a powder. Many big box hardware stores do not carry this product. 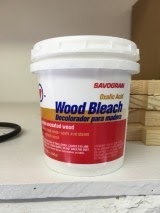 I purchased this container of Oxalic Acid at Ace Hardware. It is a 12 oz or 340 grams. It is enough Oxalic Acid to treat around 150 colonies with a vaporizer. This is the Varrox Oxalic Acid Vaporizer that Nature's Nectar LLC carries. They are the best on the market. Heavy duty. The vaporizer can be cooled in a bucket of water to cool off between treatments. So a beekeeper can rapidly move from hive to hive. A hive should have very little brood or broodless. The treatment is: Close off all entrances, have a towel or large rag to place across the bottom board entrance. Place the proper dose of Oxalic acid on the heating plate. Slide heating plate into the bottom entrance to approximately the center of the hive. Close the entrance with the towel of rag. Hook the terminals to the battery. Start a timer or stopwatch. Two minutes and thirty seconds on a charged battery will vaporize the Oxalic acid. Leave the vaporizer in for two minutes more to make sure all the Oxalic has vaporized. Pull back the towel and quickly remove the vaporizer. Put the towel back in place. Cool the vaporizer in a bucket of water. Leave the towel in place for ten minutes. The mite drop takes place for several days after the treatment. You can see the results if you are using a screened bottom board. Before treatment starts, tape some freezer paper on the slide and lightly coat the paper with Vaseline. This makes a cheap sticky board to observe the mite drop as they will be stuck on the Vaseline. Specifically: Oxalic acid is an organic compound with the formula H2C2O4. It is a colorless crystalline solid that forms a colorless solution in water. In terms of acid strength, it is much stronger than acetic acid. Typically, oxalic acid occurs as a dihydrate (containing 2 molecules of water) with the formula H2C2O4·2H2O. Where is Oxalic Acid found? OA is found in peanuts, pecans, wheat bran, spinach, rhubarb, beets, beet greens and chocolate. Some others include soy foods, sweet potatoes, black tea, berries and other dark leafy greens, like Swiss chard and collards. It is what gives food that “bitter” taste. What happens to Oxalic Acid when heated (vaporized)? When OA reaches 215 degrees (f) the water boils off leaving anhydrous (water free) OA crystals. At 315 degrees the OA crystals start to sublime (go from a solid to a gas). At 372 degrees, OA which has not sublimed decomposes to form formic acid and carbon monoxide. However, when the vaporizer is used as directed, the vaporizers will NOT decompose the OA into formic and carbon monoxide. How does Oxalic Acid kill mites? The jury is still out. It is thought that OA vapors enter through the soft pads of the mite’s feet and travels to the blood stream, killing the mite. It is also thought that it destroys parts of the mite’s mouth. However it works, it decimates mites. Is Oxalic Acid Safe for my bees and will it contaminate my comb? When used as directed, OAV does not harm the queen, bees or the brood! And it does not contaminate the comb as poisons do. There are naturally occurring levels of oxalic acid in a hive. While OAV elevates that level, the hive returns to pre-treated levels shortly after treatment. The microcrystals of OA that reform after treatment are quickly carried outside the hives by the bees. How much Oxalic Acid is used in the OAV process? The recommended dosage is one gram per brood chamber. Most have two brood chambers, so use two grams (which is very close to ½ a teaspoonful. You could use a ½ teaspoon measure in lieu of two one gram (¼ teaspoons). More is not better! 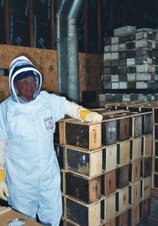 How is Oxalic Acid Heated for use in beehives? 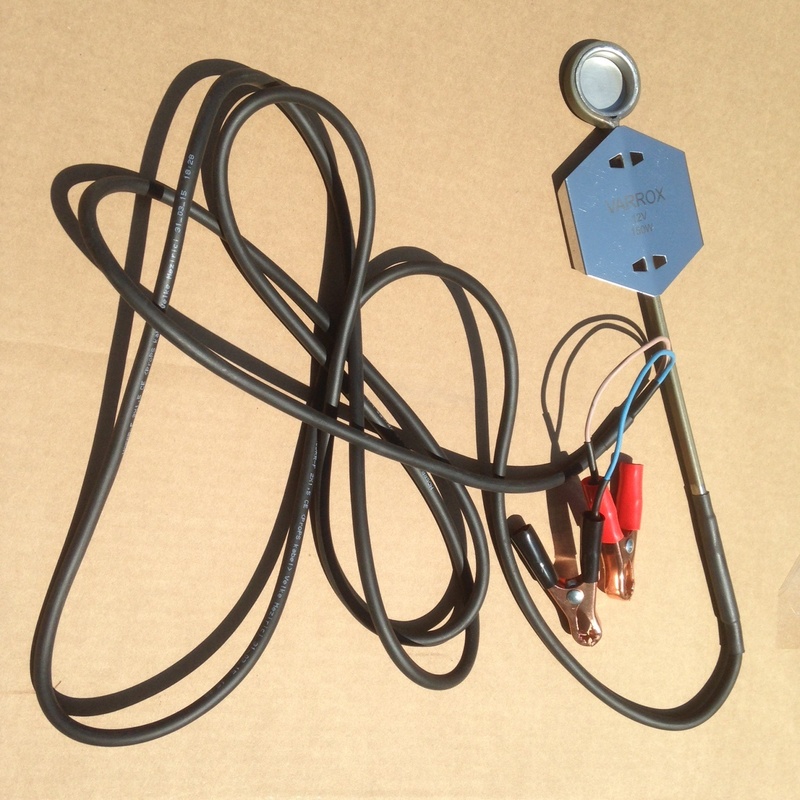 Mostly, a 12 volt, 15 amp vaporizer is used. The OA is placed in the vaporizer’s pan which is then inserted into the beehive and connected to the battery. When the current is connected to the vaporizer, it heats the pan thus vaporizing the OA. How long does it take to vaporize OA? Vaporizers take 2.5 minutes to vaporize OA. The current is disconnected after the time limit and the vaporizer remains in the hive another two minutes to finish vaporizing. One should “test fire” their vaporizer prior to using as batteries in various states of age may take longer. Also, if one were to vaporize several hives (using a vaporizer not connected to continuous charger (such is in a running vehicle)), vaporization will start to take longer and longer as the battery degrades. Mites will begin to die immediately but you’ll show the largest mite drop the day AFTER treatment. Do I have to seal the hive when vaporizing? Yes, although a “perfect” seal is not necessary. During the vaporization period, the hive is sealed and once the vaporizer is removed, the hive resealed for an additional 10 minutes. Is Oxalic Acid safe for the beekeeper? Yes, if the beekeeper takes adequate safety precautions. Keep a smoker lit in the beeyard and stand up-wind. Do not BREATHE the vapors! The EPA is stating that an acid gas respirator is sufficient, use a model 6211 which filters both vapors and particulates. In Europe a mask with an N95 particulate rating is the standard. OA vapors very quickly re-crystallize to cover all the surfaces in the hive making the breathing of the vapors unlikely. However, there is always the chance, error on the side of safety! What is the outside temperature range to perform OAV? You need an outside temperature of 37 (f). There is no top temperature. The temperature of 37 f is only needed at time of treatment and 1-2 hours thereafter. Will the mites grow resistance to OA? Since OA is an acid vs a poison, highly doubtful. OA has been used in Europe for 20+years and there is no reported resistance. When is the best time to utilize OAV? The very best time to use OAV is when the hive is broodless. Why? OA only kills phoretic mites – those on the bees, not in the brood. At that time OAV will kill an amazing greater than 95% of the mites in the hive! So when is the hive broodless or almost so? 1. At the beginning of winter (for many, somewhere between Thanksgiving and Christmas). 2. When you’ve hived a swarm. 3. When you’ve completed a split and removed most of the capped brood. 4. When you purchased a package and placed it in a hive. 5. If the bees are “flying,” the best time to treat is early morning or late evening when most are in the hive. 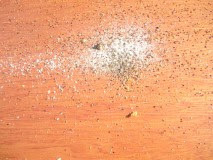 Another great time to use OAV is in late August/early September when the mites are out-breading the bees. What you are doing at that time is killing the mites that are emerging with brood and before they enter another brood cell about to be capped. During this time, you need to vaporize 3 times at 5 day intervals. If you have high mite loads year going into spring your can do a series of treatments before you add your supers, however other treatments are better suited to treat hives that are heavily rearing brood. Can I perform OAV with supers in place? No, you must remove them or place a barrier between the brood nest and the supers. Cardboard or coroplast serve well as a barrier. You can replace the supers or remove the barrier after all the vapors have subsided and new crystals formed. To be safe, wait approximately 15 minutes after you’ve removed all the seals to the hive. Can you use an extension cord on your OA vaporizer? Yes, after you’ve made the necessary electrical connections. However, you should use a 12 gauge wire on your extension cord to keep the current from dissipating thus making vaporization take longer. You can also use several vaporizers together for faster treatment of multiple hives. Is Oxalic Acid legal to use in the US in beehives? Yes, as of March 10th 2015! The EPA approved it for use in beehives as of that date! How long will my battery last during OAV? With a new, fresh battery, I’ve completed 20 vaporizations. Your results will vary with your battery. Basically, you won’t know until you tried. Can you do OAV from the top of the hive? OR my bottom hive opening isn’t large enough for the vaporizer to enter. Sure. Make a one or two inch “shim or rim” the same dimensions as your brood chamber. Cut a slot on the bottom of the shim/rim slightly larger than the rod that connects to the vaporizer. Get an old aluminum pie plate and place it on top of the frames. Fill the vaporizer with the OA, place it on the pie plate (you’ll have to flatten the sides of the pie place) then place the rim/shim over it all. Make sure you’ve closed off all openings. Replace the top cover, connect the vaporizer to the battery, don your respirator and kill some mites! Does it make any difference to what battery terminal I connect the vaporizer battery during OAV? No. All that is needed is a completed electrical circuit. Which wire from the vaporizer connected to what terminal on the battery is of no consequence. Does Oxalic Acid kill tracheal mites? It is thought so as those who have used OAV have no reported incidences of tracheal mites. However, it is not proven to do so. As other questions are posed, I’ll add them (and the answers) to this list. Want to avoid the chore of the sugar roll or alcohol wash to count mites? 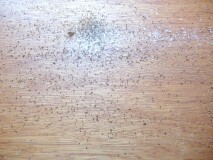 Or just want to see what phoretic mites are in your hive. Try using your vaporizer. Just vaporize as normal then afterwards insert your sticky board. The drop on the second day will show you about 95% of the phoretic mites you have killed. You can then imagine what’s still in your brood ready to emerge as 80-85% of all mites reside in the brood. You can then decide whether you need follow up with a treatment regimen. For those that practice this mite control method, performing a treatment during this time will kill greater 95% of the phoretic mites. Most beekeepers have extracted their honey and are feeding their bees if it is needed. The bees should be removing drones from the hive. Drones are not welcome in the hive over winter and will be replaced usually starting in late April or early May. Drones are produced when large amounts of natural pollen are available. Entrance reducers should be installed right now. Mice will start moving into hives with the cooler weather. The mice are looking for a nice place to ravage and an unprotected hive entrance is the perfect place to start. The entrance reducer should be at the widest opening. There has been some light frost in the east metro. Here north of Stillwater I have had frost the last two nights. Pollen is still available in small quantities at the moment. The first hard freeze will end the pollen availability, but the bees are still taking advantage of what is available. Brood rearing should be slowing down. Right now, Carniolan colonies may be broodless. Carniolans usually shut down brood rearing early. Oxalic Acid mite treatment will work well right now on a Carniolan colony. Italians will still have some brood for a little while yet. If a hive is fed sugar syrup, plan on having brood in the hive for 30 days after feeding has stopped. Temperatures are forecast to be above normal for the next three months. This may be a good sign to help the over wintering in the states of MN and WI.